The year is 1972, the trial of Britain’s very own terrorist group, the Angry Brigade, has begun and in a London squat, an anarchist, Declan O’Connell, has committed suicide. 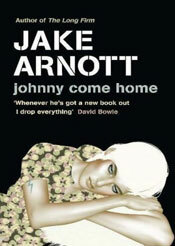 Despite his death, O’Connell is key to the plot of Johnny Come Home – Jake Arnott’s latest fact-led piece of retro fiction . O’Connell’s boyfriend, Pearson, is shocked at the death and struggles to come to terms with it. Whilst cruising the arcades, he meets a 17-year-old rent boy, who goes under the name Sweet Thing, who then moves into the squat with Pearson and the other resident, Nina, a lesbian political activist, struggling to come to terms with her sexuality. Yes – it’s not a light read. usual slowly unravelling and explosive ending. that it all comes to a halt one chapter too soon. (for example Pearson and the police ‘infiltrator’) were underdeveloped. example), you get the feeling it could almost be any year in 10.
holes, but ultimately, the man creates a good read.